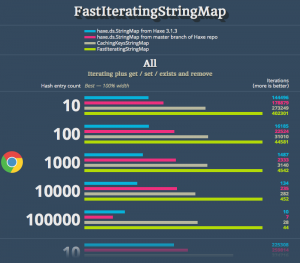 Some time ago I wrote a post about an idea, how StringMap could be implemented (for js target) to have ability to iterate fast. I continued to work in this direction, and finally idea evolved into nearly final implementation. There is excellent haxe.Utf8 class, which allows us to work with utf-8 in a cross-platform way. But what about cross-platform toLowerCase() or toUpperCase()? What regular expression should I write to replace all non-letters (including unicode ones) with, say, spaces? To solve this problems, I created zame-haxe-stringutils library. STOP right here. Before I say a few words of criticism about Haxe, you should know, that i REALLY like this language. 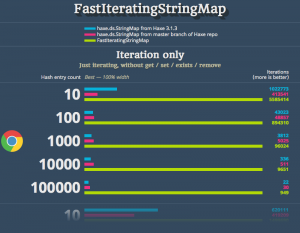 Btw, this post is pretty old, haxe was improved since I wrote it. But there are several things that make programming in Haxe more complex and not so exciting. Maybe some of that things will be fixed in next versions of Haxe, while other things is by design and will not be fixed even in Haxe 4 / Haxe 5. Anyway, I still want to talk about them.